Inglis publishes information about Inglis programs for client education, and also to raise awareness about people with physical disabilities. We offer publications specifically designed for all ages. Please use our convenient online form to request complimentary copies of Inglis literature. Please note that all PDF files on this page will open in a new window. Join our new email list to receive news, invitations, photos and more! 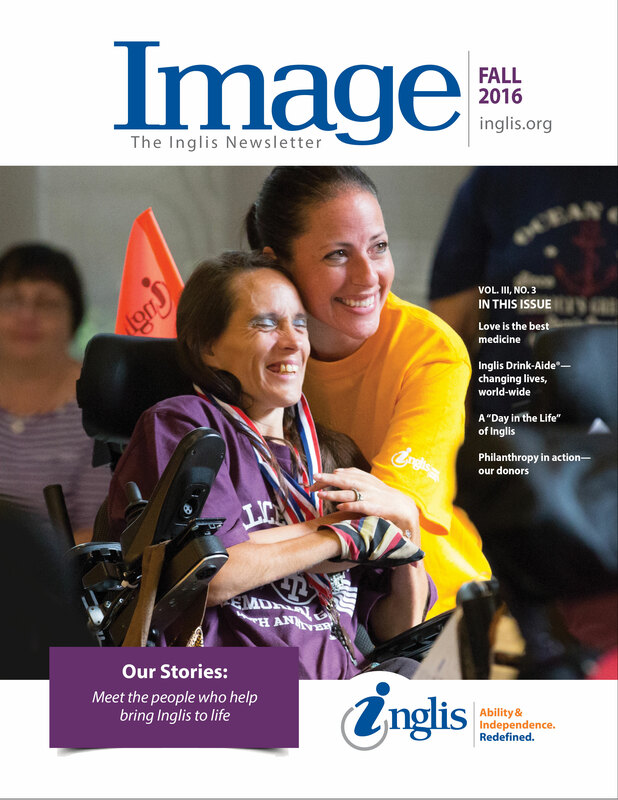 Image reports on events and activities, new programs and services offered by Inglis. Join our email list to receive Image by email! Click on this link (or the picture above) to view the Image newsletter page. Discovering People on Wheels is a question/response coloring book for early elementary children. The coloring book helps to dispel myths and encourage understanding about what people in wheelchairs can do. Educators and others across the country have found it very useful in helping non-disabled children understand people who use wheelchairs. For a free single copy, send a self-addressed 9” x 12” envelope with $1.00 postage to: Inglis, Dept. of Development & External Affairs, 2600 Belmont Avenue, Philadelphia, PA 19131. This publication is provided free of charge (in quantities of 50 or less) to schools, daycare centers, youth groups, camps and other organizations. A copy of the Teachers' Resource Guide — with suggestions and educational strategies for teachers to use in developing a learning unit on disability awareness — is included with orders. Use our convenient online form to request copies. Please include the name and address of your school or organization, as well as a contact person's name and phone number. This newly redesigned, informative brochure provides older elementary school children and adults with tips on what to do — or not to do — when meeting or assisting someone in a wheelchair. For a free single copy, send a self-addressed #10 business envelope with 59 cents postage to: Inglis, Dept. of Development & External Affairs, 2600 Belmont Avenue, Philadelphia, PA 19131. This publication is provided free of charge (in quantities of 50 or less) to schools, daycare centers, youth groups, camps and other organizations.